I like puzzle games and I like things that are expressly cute without overdoing it. I like quirky fun music and the graphic styles of old story books. Forgive me if I'm not just a little bit biased toward Ilomilo. Southend Interactive and Microsoft Game Studios have crafted a heartwarming and fun platform puzzler which was (at launch) an exclusive with AT&T. 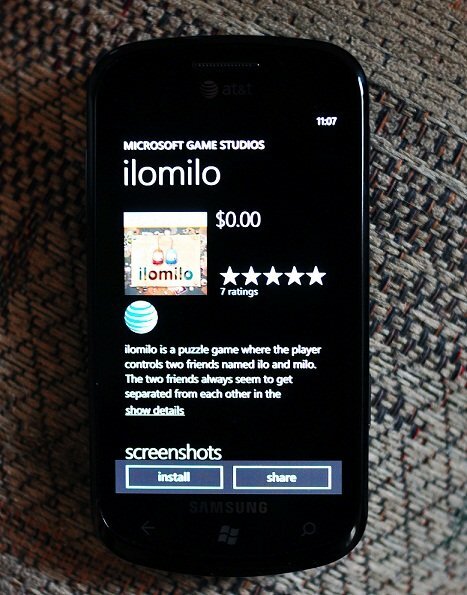 AT&T customers get a free copy of Ilomilo up until the new year with each purchase of a Windows Phone 7 device. Ilomilo is not yet out in the Marketplace for all to purchase so as of now, subscribing with AT&T is the only way to play it. It's assumed it will be released to everyone just before the new year and a much heartier Xbox Live Arcade (XBLA) version will be out soon after 2011. AT&T also offers an opportunity to their subscribers to download the XBLA version earlier than the rest of humanity as part of their special exclusive deal. The gameplay of Ilomilo is very simple, very easy to master, and works very well with a touchscreen if you're a righty or a lefty - you have the option of flipping the controls. The music repeats throughout the levels and could persuade you to drown the volume down to nil but it's actually been my experience to enjoy the music. Even after a couple of hours. It complements the tone of the game exceptionally well with an upbeat vibrancy that may keep you in the mindset of playing along to the end. The basis of Ilomilo is to reunite two characters named Ilo and Milo. Each level begins with each character at separate ends of unlevel and sparse platforms with you in control of their movement. By switching between Ilo and Milo's progression through each level you'll find yourself pushing switches that move platforms, migrating boxes to more useful locations, and exploring a 3D landscape with hidden curios and hard to reach collectibles. There are no hazards in Ilomilo. You never have to worry about falling to your death or how much more damage you'll be able to take. Nothing can hurt you here. Other than a few hidden collectibles and objects which you'll be able to interact with, the levels are fairly barren. Each level appears to float in a space within a park drawn by a child or found within a scrapbook. Everything about the game adds to the compulsion of enjoying some quick lighthearted fun. Speaking of quick - Ilomilo can be completed in just a few hours and leaves very little re-play value. There are six introductory levels to learn the ropes and another twenty four puzzling levels to go from there. Of those are bonus levels that are only unlocked after finding all the collectibles in each chapter and an additional three challenging levels after completing the game. While you could be disappointed at how quickly it's over you may only reach that conclusion after realizing you couldn't put Ilomilo down. ilomilo costs $4.99. Get it here on the Windows Phone Store.